The cover of Deborah-Anne Tunney's debut story collection is so evocative, and the stories within won't disappoint. In this this list, Tunney provides some other great books to curl up with while the world is quiet and the snow falls outside. Is there anything more enjoyable, relaxing, or soothing for the soul than being in a warm room, a fire burning, snow falling silently out the window? With time to settle into a book, as you would settle under a warm duvet. Watching snow fall has always evoked in me a expanding sense of isolation and yet comfort, much as reading the best fiction does. 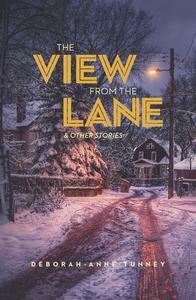 My own book of short stories, The View from the Lane, has a few such scenes of snow falling. I was hoping in those scenes and through the image of falling snow to give the reader a sense of aloneness, of being caught in quiet contemplation and reflection, where the mind settles, akin to the settling of the reading mind. My recommendations for what to put before that reading mind have been culled from a multitude of Canadian work, many of which I feel badly about leaving off this list, but as we all know time is finite and at some point the snow will stop falling. I remember reading this book on a bus that wound its way through Ottawa streets on the way to my first job, years ago. I believe it was snowing then too, and I remember the fraught love of the novel, its sadness (I was just learning how closely that kind of sadness relates to beauty). Here we find the power of romantic obsession and the power of Anne Hebert’s prose to leave us bereft and alert, but also broader, our empathy deepened. The novel is a quick, beautiful read, the characters almost mythical in their situation and intensity. There are so many books by Alice Munro that I could choose, but after I read this book (and I can’t remember if it was snowing, so rapt was I in its mastery), I felt I had been to the summit of what writing can accomplish. The prose is so clear that you can see through it to the reality it depicts. Some of the scenes and images from these stories are in fact so vivid, that they have lodged in my mind with the same claim to permanence as my own memories. I’m saying nothing new or nothing that has not been said elsewhere with more erudition, but our Alice is an amazing writer and here is an amazing collection that shows her at the top of her game. It surprised me that when this novel was released, it did not receive the fanfare I thought it deserved. From its evocative title, to the story that mixes so beautifully good and evil, time and place, action and consequence, we are given a portrait of the power of childhood to create the patterns that will limit and define us throughout not only our life, but potentially, the lives of generations to come. I found the novel, its weaving of time and place, equally haunting and beguiling. This collection of stories was released more than 25 years ago and I loved it then and love it now. I was tempted to list Isabel Huggan’s second book of stories, You Never Know, but there is something about the first time you read an author and come away enriched and yearning for more that stays with you so that the book itself becomes almost mythical in its importance. The stories are so rich in the detail of a young girl’s and woman’s life, so true and full of humanity and insight that it deserves its reputation as a Canadian classic. A compelling story linked to the historical figure of Joey Smallwood, this novel perfectly marries the personal with the political, the story of a man with the story of a nation. The writing is sure and with such depth and wisdom that I would follow it anywhere. It is impossible to forget some of the images found here: Joey trudging across Newfoundland in the snow (again snow), Joey desolate in New York City sleeping in Bryant Park, Joey witnessing the horrific aftermath of the great sealing disaster of 1914. This work is an amazingly complex, beautiful novel, by the end as solid as a house in the mind of the reader and full of intriguing characters that we cannot help caring deeply about. What a gift Guy Vanderhaeghe has given us with his novels and he is best known for their powerful depiction of situation and character. I am always anxious to read his latest work, but here I recommend his second book of short stories, perhaps showing my inherent bias for that form and perhaps because I feel he has not been acknowledged as the great short story writer he is. In this book you’ll find a collection, brilliant as stars, full of his signature wit and unflinching observations. I remember reading these stories on a trip to Europe and being overtaken by a sense of home. His rendering of childhood and young adulthood in particular was illuminating as he showed the humour, pathos and sadness inherent in these stages. Released in 1992, it depicts different lives at different points of maturity and yet all are linked through the humane imagination of this inspired writer. This novel came out last year and has been gaining attention and admiration since. It is deeply touching and important as well as being a compelling read, a book you truly cannot put down. Gillian through the book must come to terms with her childhood in Wales during the war, the secret she has kept and brought to Canada and with the family and especially her mother who does not understand or appreciate her daughter. Full of unforgettable characters and situation, and like Elizabeth Hay’s Alone in the Classroom, the book expands our appreciation of the power of childhood to haunt and influence the rest of our lives. There are books, if we are lucky, that stay with us and nourish our imagination even years after we have read them. Like This is such a book for me. I first read it when it came out and was nominated for the Giller in 1994. Set in a fictional town in Nova Scotia, we find ourselves in a soiled but resolute place, a place where evil is indeed banal, and perhaps even lazy. There’s a palpable sense of defeat and yet also a sense of the fantastical, a hope that transcends the confines of this place and the lives depicted. The writing is vigourous, at times unsettling, and always surprising. With the first snow fall of this year, I found myself reading the first collection of a friend’s book of poetry; there was a fire in the fireplace, my cat at my knee, and snow falling before the window. Perfect! The poems of this book matched the stillness of the snow, the crackling fire, the purr of the cat, so elemental are they, as they distil in beautiful detail and artistry the experience of being a mother, a wife, a person in the world. In often hauntingly beautiful phrases, Frances endows the everyday with the profound and the deeply humane. Her touch is perfect in these poems, it gives us grace and patience and wonder in equal measure. A wise book, it kept me warm and grateful long after I had read it.